Lorna Brockie and her baby Micah meet NSW Premier Gladys Berejiklian at Westmead Hospital’s maternity ward today. Expectant mums, new parents and newborns will benefit from a landmark $157 million Parents Package in next week’s State Budget. Premier Gladys Berejiklian, Treasurer Dominic Perrottet, Health Minister Brad Hazzard, and Mental Health Minister Tanya Davies announced the news at Westmead Hospital today. The funding announcement will boost the number of midwives and family health nurses, invest in testing and treatments for children’s diseases, and provide practical and emotional support to parents. The Premier said that the funding includes 100 more midwives, extra child and family health nurses to support new parents both in hospital and at home, and an optional “Baby Bundle” of essential items for new parents. Ofa Latu and her baby Petilisa. Ofa said the baby bundle will be a great help for new mums. 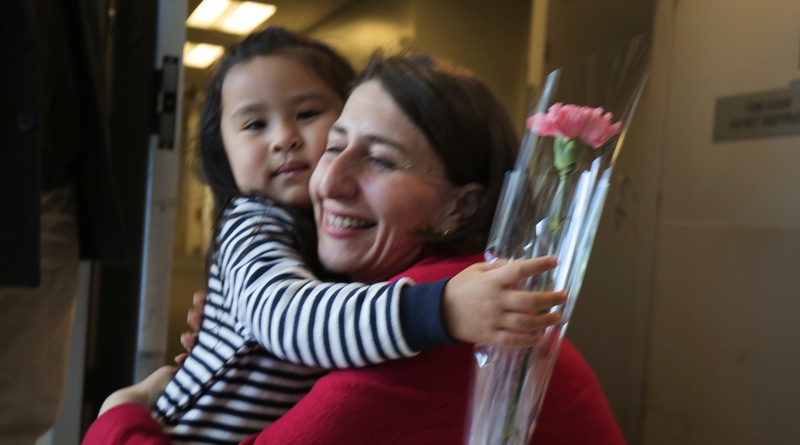 “We are there for NSW families, right from the very beginning, providing significant support during one of life’s most exciting journeys,” Ms Berejiklian said. Mr Perrottet said the Budget also includes research funding for childhood cancer and other genetic diseases. NSW Health Minister Brad Hazzard said the package is a great help for new parents. “Babies don’t come with a manual but this new Parents Package is a clear indicator to mums, dads and carers that the NSW Government is keen to back you in your vital parenting role,” Minister Hazzard said. Minister for Mental Health, Women and Ageing Tanya Davies said the government wanted to do more to support new and expectant mothers. “Today’s investment in perinatal mental health teams will complement recently announced plans for a mums and bubs unit in Western Sydney,” Minister Davies said. The NSW Premier meets young Jade at the entrance of Westmead Hospital’s maternity ward. Jade was on the way to meet her new baby sister Alexis. Baby bundle – Essential and every day care items – such as a baby safe sleeping bag, room thermometer, wipes, nappies and educational materials – for new parents to support the health, development and well-being of their babies ($7.6 million). Increase to midwife numbers – 100 more midwives in 2018-19 to support maternity services across the State, bringing the total number of midwives to 3020 ($9.3 million). More nurse home visits to new parents – Additional nurses across the State to expand the NSW postnatal visit program so new parents can choose to have an additional home visit by child and family health nurses in the first months of their child’s life. This includes partnering with the early parenthood NGO Karitane to employ additional nurses to provide virtual home visits ($4.3 million). Paediatric Precision Medicine – Additional investment in technology and staff to advance paediatric precision medicine to help treat childhood cancer and other genetic disorders ($5 million). Additional Regional Family Care Centres – Partnership with Tresillian to establish five Family Care Centre Hubs in Queanbeyan, Coffs Harbour, Dubbo, Taree and Broken Hill for vulnerable families living in rural NSW to provide local intensive support at early infancy ($2.2 million). Paediatric Amenity Upgrade – Improve indoor and outdoor hospital play spaces for children, including those with mobility issues or connected to medical equipment. These sites will include Griffith, Wollongong, Nowra, Hornsby, Armidale, Goulburn, Bathurst and Manning Base Hospitals ($2 million). Maternal transfers – Enhance systems across the State to support safe and timely transfer of pregnant women who require higher levels of care ($1.5 million). Specialist perinatal mental health services – Increased specialist perinatal and infant mental health services, which will deliver mental health services to pregnant women and mothers with severe and complex mental illness ($1.1 million). Newborn Bloodspot Screening expansion and research pilot – NSW will be the first State to expand screening to include the life-threatening disease Congenital Adrenal Hyperplasia ($200,000). Recently $2 million was provided to pilot the addition of Spinal Muscular Atrophy (SMA) and Severe Combined Immunodeficiency (SCID) to the newborn bloodspot screening program as part of a research initiative coordinated by Paediatrio. Supporting prospective parents and pregnant women with important health advice – Updating the booklet Thinking of Having a Baby, which offers important advice, including pre-pregnancy genetic carrier screening, and supporting a Stillbirth Foundation campaign to encourage pregnant women to sleep on their sides to decrease the chance of stillbirth.